The Contracting Education Academy at Georgia Tech presents the Architect-Engineer Contracting course on the Midtown Atlanta campus February 11-15, 2019. The course is ideal for both government contracting personnel as well as contractors looking for insights into the government contracting process for procuring architectural and engineering services. CON 243: Architect-Engineer Contracting is a five-day course, focusing on issues across the contracting spectrum, including acquisition planning, source selection, proposal analysis, contract award and work, and contract management. Specific topics and practical exercises allow professionals to gain knowledge of the Selection of Architects and Engineers statute (formerly known as the Brooks Act), the Standard Form 330 for submitting credentials, the slate and selection process, review of government estimates, liability issues, Title II services, contract modifications, and responsibilities of the contracting officer’s representative (COR). Students learn how to research proper application and interpretation of various regulations, including applicable Public Laws, the Federal Acquisition Regulation (FAR), the DFARS and other Agency Supplements to the FAR, and legal precedence. This federal contracting course is approved by the Defense Acquisition University. Students who successfully complete the course receive credit toward the FAC-C and DAWIA certification programs. Students also receive 3.5 CEUs from Georgia Tech. Contracting officers, contract specialists, contracting officer representatives, program/project managers, small business specialists, industry contracting personnel, architects and engineers. Determine if the services require Selection of Architects and Engineers Statute procedures and how to identify the basic steps necessary for the requirement. Distinguish how the project is to be advertised and determine what is to be contained in the advertisement. Determine the elements necessary for performance work statements. Determine applicable cost principles specific to A-E contracting in order to prepare a Government estimate or review a proposal. Recognize when and how a Government cost estimate for the project is developed. Distinguish how the Government maintains quality assurance on the contract after it has been awarded. Analyze the roles and responsibilities of those charged with the management and administration of the contract after award. Schedule and Registration for CON 243: Architect-Engineer Contracting – click here. Don’t miss our Construction Contracting course coming up on Feb. 25th! Details are here: https://pe.gatech.edu/courses/con-244-construction-contracting. The Contracting Education Academy at Georgia Tech presents the Architect-Engineer Contracting course on the Midtown Atlanta campus May 16-20, 2016. CON 243: Architect-Engineer Contracting is a five-day course, focusing on issues across the contracting spectrum, including acquisition planning, source selection, proposal analysis, contract award and work, and contract management. Specific topics and practical exercises allow professionals to gain knowledge of the Selection of Architects and Engineers statute (formerly known as the Brooks Act), the Standard Form 330, slate and selection process, review of government estimates, liability, Title II services, modifications, and contracting officer’s representative (COR) responsibilities. In this advanced course, students learn how to research proper application and interpretation of conflicting regulatory guidance, including Public Laws, the FAR, the DFARS and other Agency Supplements to the FAR, and legal precedence. Schedule and Registration for CON 243 – click here. 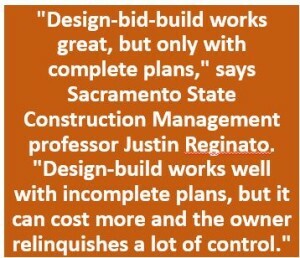 Owners face a ton of decisions when considering a new construction project: Who will do the architecture? Where should we located it? How big should the floor plates be? One decision that doesn’t always get much attention is just as important: Project delivery method. 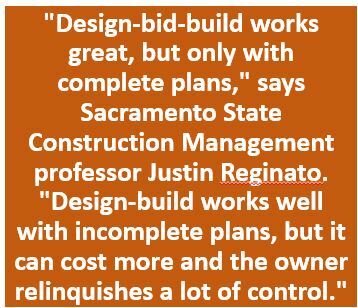 That’s the term that describes the process by which the project will be designed and constructed, and it’s at the heart of the drama around Valley Medical Center’s long delays and spectacular cost overruns. The Contracting Education Academy at Georgia Tech (The Academy) was recently approved by the Defense Acquisition University (DAU) to teach CON 243: Architect-Engineer Contracting and CON 244: Construction Contracting. These two new professional education courses will be offered by The Academy in 2016. The courses are ideal for both government contracting personnel as well as contractors looking for insights into the government contracting process. CON 243: Architect-Engineer Contracting is a five-day course, focusing on contracting for architectural-engineering services, covers issues across the contracting spectrum, including acquisition planning, source selection, proposal analysis, contract award and work, and contract management. Specific topics and practical exercises allow professionals to gain knowledge of the Selection of Architects and Engineers statue, the Standard Form 330, slate and selection process, review of government estimates, liability, Title II services, modifications, and contracting officer’s representative (COR) responsibilities. In this advanced course, students learn how to research proper application and interpretation of conflicting regulatory guidance, including Public Law, FAR, the DFARS and other Agency Supplements to the FAR, and legal precedence. Schedule for CON 243 – click here. CON 244: Construction Contracting focuses on unique construction contracting issues, such as acquisition planning, contract performance management, funding, environmental concerns, construction contract language, and construction contracting in the commercial setting, the Construction Wage Rate Requirements Statute, design/build, basic schedule delay analysis, constructive changes, acceleration, and construction contract quality management. Contracting officers, contract specialists, contracting officer representatives, program/project managers, small business specialists, and industry contracting personnel. Apply the Federal acquisition laws, regulations, Department of Defense and other agency supplementation, policies, procedures, and best business practices in soliciting and administering construction contracts. Contrast the regular support requirements with a Construction Acquisition Plan in accordance with FAR Parts 7 and 36, DFARS Parts 207 and 236 and agency supplements, policies and procedures. Develop a construction solicitation package in accordance with FAR, agency supplements, and policy/procedures. Evaluate the appropriate construction contract awardee. Determine the applicable construction contract administration (compliance) approach, using FAR, DFARS, DoD regulation/guidelines, and other relevant agency supplement, procedures and best business practices. Formulate the remedy and appropriate clause for a changed construction condition in accordance with Federal and DoD acquisition and other agency laws, regulations, and best business practices. Document appropriate actions necessary to verify for construction progress payment or construction contract closeout. Schedule for CON 244 – click here.